Fashion Photography : Al is a young Fashion Photographer from Cardiff, UK. It's just been a year since he has started Fashion Photography and he has definitely made head turn. 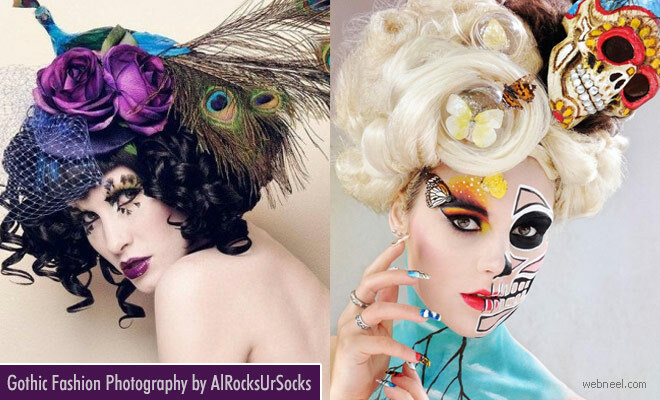 We specially love the head gears used for the photography. Sometimes we feel we are looking at fruits, vegetables or even animals in his portrait fashion photography. Loved the use of peacock feathers with a peacock sitting on the head like a hat. Al loves bright and bold colors and all his models look stunning under his lens. We liked the gothic fashion photography of a woman wearing red roses as a tiara and her face is covered with designs which looks beautiful and scary. This is going to be my halloween dress for this year.